A Positive Input Ventilation (PIV) unit is a low cost alternative to MVHR and a more energy efficient option than traditional extract ventilation. 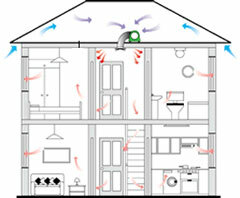 By gently supplying fresh, filtered air into your home, taken from either your ventilated attic or an exterior grille, the PIV creates a positive indoor air pressure to 'push' old, contaminated, vapour laden air out of your property, at the same time eliminating cold draughts from trickle vents and other gaps in the building fabric. A PIV will normally resolve any damp and mold issues within weeks if not days providing a healthier, fresher indoor environment. The installation of a low energy positive input ventilation unit will completely replace the air in your home around 20 times a day, the recommended rate to maintain good air quality. A PIV unit tempers the fresh air supply by recovering unused warm air from the attic. During Winter months a small electric heater can be used to take the chill off the air supply. A solar energy collector is also now available to warm the incoming air supply and thereby reducing your overall heating demand. A PIV unit filters out external pollutants, dust, traffic fumes and pollen thanks to high efficiency G4 filters. The air movement created by the PIV will also help to remove a significant amount of the dust particles inside the property too. A PIV unit will operate with little or no regular maintenance other than a very occasional filter clean or vacuum. Running 24x7 with minimal energy consumption at an almost imost imperceptable noise level, a typical PIV unit will cost less than £10/year to run and will provide significantly more energy into the home than the energy it consumes, providing a considerable net energy gain. The Drimaster ECO HEAT HC is a Positive Input Ventilation (PIV) unit with integral 400W heater to automatically temper the incoming air during cold weather. Compatible CO2 and humidity sensors for automatic fan speed adjustment.